Gary Gygax, who just passed away, changed my life. Indirectly but still. He was one of the great imaginary enablers of our time. His creation, along with several others, not so much of Dungeons & Dragons itself, but of the role-playing game as an immersive storytelling form, has been central to the development of my imaginary since I was about ten. I never knew much about the man, other than the fact that his name was eminently fitting — I always imagined him as a kind of warlock existing somewhere between fact and fantasy. The ancestor of the waking dreams my fellow travelers and I have shared for so many years. I was first introduced to the idea of the roleplaying game by a good friend who was not only more streetwise than I, but had an older brother and through him a bunch of hoodlum-in-the-making big friends that also happened to enjoy imaginary worlds. What they were doing at this time was edgy, not nerdy. I simply didn’t get how all this was possible, but it sounded cool. So he invited me along to one of their D&D sessions, as an onlooker and -listener, and that was all I needed — everything clicked. The very next day in school, I drew up a map of a fantasy world in imitation of the one I’d seen the night previous and recruited a bunch of my friends as players to my gamemaster, establishing the pattern of most of my roleplaying since then. Over the next few years, we each took turns inventing our own worlds and involving each other in them. There was a lot of dice-rolling hack’n slash, kill-the-monster-get-the-treasure type stuff going on, of course, but we very quickly realised how the possibilities were defined by our imaginations and nothing else. At this point, we didn’t even play according to a game system, but just made things up as we went along. Much to both the frustration of our teachers — we were literally playing in class — but for the same reason also to their relief — we weren’t being pests doing it. If they left us alone in the back, we were more than happy to entertain ourselves, so they didn’t have to. This was the time when concerned parents and religious nuts on both sides of the pond were voicing the inevitable concerns — back with a vengeance today — that we children might get lost in our imaginary worlds and no longer be able to tell them apart from hard-knock reality, eventually worshipping Satan, burning down our houses and killing our families, as had allegedly happened somewhere in the States. Although I interviewed the Evangelical spearhead of these concerns in Denmark — a rather nice, but terribly serious man — for a school radio project, I never quite understood it. To me, it was always about seeing reality in a different way, letting your imagination loose on it and finding in it images and stories. And roleplaying was as much an education as what was, or was not, going on in school. The following decades, through high school, idling days, military service and college, my roleplaying activities played a central role in building my interest for the world around me and its history. It was through roleplaying that I came to look into such things as the geography of Norway, modern Indian history, the Russian spirit world, the city planning of old Copenhagen, the native populations of the Pacific Islands, life in Victorian London, and, even initially, the Italian Renaissance, which has now, as I write this, once again brought me to a Venice shrouded in fog. True magic. Roleplaying — tabletop as well as live — created a carefree environment for the channeling of my interests in world-building, the creation of fictional characters, storytelling and even acting. To me, it remains one of the ultimate immersive experiences for challenging your imagination, as well as an ideal common ground for social interaction with peers. It’s basically a damn good time with friends and strangers alike. Dungeons & Dragons, Gygax’ co-creation, arrived in our circle a year or so into our lives as roleplayers. A friend was given the red Basic Set (Levels 1-3) as a gift. The one with the great Larry Elmore illo on the box cover, of a viking-type hero, back turned, sword drawn, fighting a huge, red dragon hoarding glittering treasure. Although I would eventually come to recognize the flaws of the level-based system of D&D, the promise held in that box, with all its freakish monsters and strange lands, remains a stirring memory to this day. This was the concept: as you advanced through your gaming experience, you achieved greater capabilities and knowledge. 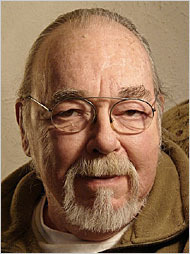 Although I’m not sure it was Gygax’ idea — I think he’d left TSR, the game company he’d founded, at this point — the advancement scheme of the game was at this point in time ordered, commercially, into a number of individual gaming ‘sets’ that each revealed more about the gaming world and its principles as you went along. We only got as far as the blue Expert Set (levels 4-14) before graduating to Advanced Dungeons and Dragons, which was basically the same game but with oodles more information available at once and a presentation that made more sense. It still retained the ordering of your gaming life into ‘levels’ attained through the accumulation of ‘experience points’, however. Though I definitely tired of this rather restrictive and unconvincing structuring principle, I still recognise that it somehow provides a perhaps crude but nevertheless poignant summation of man’s search for insight — Platonic, Buddhist, the lot — and is, as such, quite a beautiful conceit. Beyond the blue set were the green Companion Set (levels 15-25) and the black Master’s Set (levels 26-36). As mentioned, we never managed to venture that far before leaving D&D, and eventually also AD&D, behind for other systems and ways of roleplaying, but I still remember imagining how it would surely take a lifetime of playing to reach level 36, beyond which apparently lay a kind of demigodhood, the distant, incomprehensible order of which was sketched out in the gilded Immortals Set. Following his own logic, I would kind of like to think that Gygax has now arrived there. Thanks Gary, you made worlds of difference. Gygax Obits: The New York Times, game designer Monte Cook, Wired, Tom Spurgeon. Also, check this 2004 interview. Photo from Associated Press.